Mike Kalaman of Norm Bloom and Sons puts freshly caught lobsters into a cage and lowers it off the side of the dock into the water on Friday, September 6, 2013, where the lobsters will stay until they are sold. On Friday, Norwalk lobsterman Mike Kalaman was pulling his traps around buoy 11b off Eatons Neck, in the deepest waters in the western end of Long Island Sound. Kalaman's traps, and those of the dwindling number of lobstermen left on Long Island Sound, will be stacked on dry land as part of a program implemented Sunday by the Atlantic States Marine Fisheries Commission closing the entire Long Island Sound lobster fishery until Nov. 28. After 37 years hoisting traps, Kalaman says he cannot believe it has come to such extreme measures. "What they should have done 14 years ago was recognize that pesticides were the problem," Kalaman said. "We are not the cause of this and we never were. For them to take it out on us, we have complied with everything they have asked. They have been grasping at straw after straw after straw." Once part of a fleet of 16 lobster boats in Norwalk, Kalaman is the only one left, and like many of those who still remain, he blames the pesticides used to kill mosquito larvae for the decimation of the Sound's once thriving lobster industry. Roger Frate, president of the Western End Lobsterman's Association, called the decision by the fisheries commission to close Long Island Sound "nerve wracking." "We have been beaten to death around the clock," Frate said at his seafood store on Darien's Post Road last week. Since the die-off that began in September 1999, when lobstermen in the western Sound started pulling dead and dying lobsters up in their traps, Frate says the state's lobstermen have been subjected to a series of gauge increases -- continually increasing the size of legal lobsters -- and gate size increases on the traps which have allowed bigger and bigger lobsters to escape capture. All to no avail, Frate said. "They are getting poisoned every year and we are getting whacked," he said. "The only way the fishery is not going to be doomed is to stop using the pesticides over on Long Island and Westchester County," Frate said. This summer, Gov. 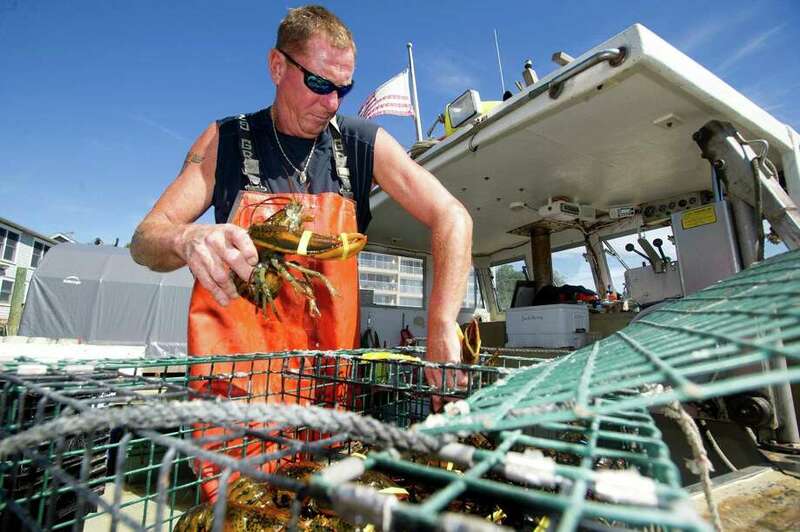 Dannel P. Malloy signed a bill prohibiting the use of methoprene or resmethrin -- pesticides dropped in storm drains that Frate and other lobstermen believe are killing their catches. But DEEP Marine Fisheries Director David Simpson said the shutdown is intended to reduce landings in the Sound by 10 percent, because the lobster population is critically low. "The fishery has collapsed, especially in the central and western Sound. Only remnants are left, and we need to do what we can to leave enough reproductive capacity to grow the population back if environmental conditions improve," Simpson said. As far as what led to the decline, Simpson said rising water temperatures have brought more disease causing additional stress to the lobsters and outright mortality. With Long Island Sound at the southern limit of the lobsters' inshore range, coupled with rising water temperatures, it is no surprise to see range contraction, Simpson said. "They are not going to be able to persist here very well at these temperatures. This is largely what they are facing," Simpson said. "There are some lobstermen concerned about pesticides, but I don't share that view." While University of Connecticut researchers are looking into what role pesticides may play, Simpson said there is no indication at this point that they are playing any significant role in the decline of the lobster population. "I think part of the message is that things are changing and we are going to have to change with them," Simpson said. "If conditions get better for lobsters, we are going to have to leave enough in the water to reproduce so they have a chance." Simpson said he doesn't know anyone that believes that taking 10 percent fewer lobsters out of the Sound will cause a rebound. "But at the same time, we cannot continue to fish until there are none left." Long Island Soundkeeper Terry Backer, a state representative from Stratford who grew up hauling lobster traps with his father on the Sound, said he has a hard time reconciling a 10 percent catch reduction when lobstermen are taking so few lobsters out of the Sound now. "I don't see the benefit in this closure. One thing the few lobstermen who still exist provide to the state and federal government is a monitoring function so they can look at production and see where it is going up or down, Backer said. He said there are still periodic die-offs, and having lobstermen out there recording what is happening is something the state or federal governments cannot afford to do. Sure, some lobsters will be saved, "but are you preserving them to die later?" he asked. Backer said he wasn't sure what killed the lobsters, but he believes more research needs to be done on pesticides and their effects on lobsters. Nick Crismale, president of the Connecticut Commercial Lobsterman's Association, disagrees with Simpson's temperature theory, saying the Sound supported millions and millions in its warm waters in the past. He says malathion killed the lobsters initially in September 1999 after Hurricane Floyd came through and washed the pesticide -- used at that time for West Nile-carrying mosquitoes -- into the Sound. He said the pesticide compromised the lobsters' nervous system and sent the lobsters into convulsions, forcing some pregnant females -- known as eggers -- to prematurely molt their hard shells, with their eggs still attached. "I don't think the lobsters can sustain themselves, whether they have this program or not," said Crismale, who has finally decided to sell his two fishing boats, nearly 2,000 lobster traps, clam dredges and other fishing gear following his 14-year "futile" fight to get those in charge to solve the problem with lobsters. He said there are only 12 to 14 lobstermen still on the Sound and none to his knowledge are making all of their money exclusively from lobsters. "There is no confidence on the part of the industry that the people in charge know what they are doing or that they are capable of bringing the resource back," Crismale said. "The fight has taken the wind out of my sails."